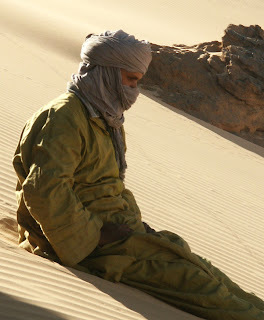 Yesterday I had the great privilege of speaking with a Tuareg man from Mali. He runs community programs for his people in Timbuktu. I was writing a piece about the coup in Mali, and I wanted some background about the Tuareg rebellion- the catalyst that led Mali's army to seize power from the government. I don't know how long the interview lasted, but my pen could not write fast enough. The scope of the Tuareg's history, their migrations and discontent, their history in conflicts from Libya to Niger, was staggering. I felt a deep sympathy for this people without a home, but at the same time I ached for the soldiers being pitted against their superior weapons and tactics. When I hung up the phone, I was exhausted. My colleague across the desk looked at me, quite worried, but I just shook my head. What can someone do in the face of a conflict that has lasted for over a hundred years? My answer was, as it has always been, to write about it. I was overwhelmed, but my fellow editors and journalists at Tunisia Live encouraged me to dig deeper, and to write the article I have linked below. I hope you will read it, because Mali needs the world to understand what has been going on for too long inside their borders. A Tuareg in Algeria sits in his army fatigues. Photo by Garrondo, courtesy of Wikimedia Commons.